Brussels sprouts with bacon and maple syrup… just a hint. Sounds good, right? This delicious side dish come together in a matter of minutes with a simple blend of ingredients including dijon mustard, shallots, currants, bacon and a touch of real maple syrup. These Tangy Glazed Stovetop Brussels Sprouts are a perfect side dish for the holidays or any weeknight and they’re truly irresistible. As a kid, I wasn’t that “into” brussels sprouts. We didn’t have them very often and their distinct aroma and cabbage-y flavor didn’t jibe with my 10-year-old sensibilities. Of course, these brussels sprouts with bacon and maple syrup are nothing like what I had as a kid. Instead, they’re tangy, smoky and sweet. The plumped dried currants (a vastly underused fruit in my opinion) add delicious little pops of sweetness to the stovetop brussels sprouts. Bacon adds layers of flavor because the vegetables are cooked in some of the bacon fat (#heaven). Make these your Thanksgiving brussels sprouts next to Tom Turkey or serve as Christmas brussels sprouts beside your holiday roast or baked ham. You won’t be disappointed. Thanksgiving Brussels Sprouts or Christmas Brussels Sprouts? I buy these cruciferous vegetables often to go with pork chops or roast chicken, but this recipe is so good, it could become your standard holiday side dish. Think “Thanksgiving brussel sprouts” in lieu of “green bean casserole”. The gorgeous harvest colors lend themselves to fall and winter entertaining. To make the dish even more eye-catching, I use a combination of green and purple brussels, however, it’s not necessary. A simple swap of dried cranberries for the currants would subtly change the color palette and voila — Christmas brussels sprouts. Prep the vegetables by removing the tough end. If they’re small enough for bite sized, keep them whole. If they’re on the grand scale — you may need to halve them. Cut the bacon into larger pieces and crisp them in a large skillet. Transfer the bacon to a dish lined with paper towels. Save a bit of the bacon grease and sauté the shallots and brussels sprouts in the skillet. Once the vegetables have softened a little and taken on some color, stir in the broth and currants, scraping up the bacon fond (those browned bits stuck to the pan). Cover the pan with the lid, so that it’s slightly askew and steam can escape. Simmer the brussels sprouts for 5-8 minutes or until the brussels are tender and the currants are plump. Stir in the butter, dijon and maple syrup to evenly coat the sautéed brussels sprouts. Top with crisped bacon and parsley to serve. This is such a simple recipe, that you shouldn’t wait for a special occasion to make it. Any ordinary Tuesday night seems like the right time for a better than average side dish, don’t you think? Besides, these stovetop brussels sprouts would be just as good with a rotisserie chicken as a brined roast turkey or homemade ham. Enjoy! Brussels sprouts a whole new way... This simple, one pan recipe raises the humble brussels sprout to new levels with bacon, shallots and whole grain mustard. Try it tonight. Cut the bacon into 1" pieces. Place a large skillet over medium high heat and add the bacon. Fry until crisp and golden. Transfer bacon to a plate lined with paper towels to soak up excess fat. Discard all but 1 tablespoon of bacon fat from the pan. Add the shallots and brussels sprouts to the hot pan with reserved bacon fat and stir. Cover with a lid and reduce heat to medium. Cook for 3-4 minutes, stirring occasionally. When the shallots are tender and slightly translucent, stir in the broth and currants, scraping up the bottom of the pan to incorporate some of the bacon fond. Bring to a boil. Place the lid on the pan, so it sits askew and the steam can escape. Reduce heat to a simmer. Cook the brussels sprouts for 5-8 minutes or until the brussels sprouts are tender, stirring occasionally. The broth should reduce to about 1/3 cup. Stir in the butter, whole grain mustard and maple syrup. Season to your taste with salt and pepper. Transfer the brussels sprouts to a serving platter and sprinkle with the crispy bacon and parsley. Pin “Tangy Glazed Stovetop Brussels Sprouts” For Later! Another great brussel sprout recipe! I think the roasted sprouts are fabulous but these….holy cow! So glad you like them, Nola! Loving all your pictures and of course the recipe. I wasn’t into brussels sprouts when I was younger either. Just hadn’t had them prepared correctly! I’ve also never run across purple brussles sprouts. They’re so pretty. Brussels sprouts are my favorite! i love your addition of the grainy mustard! What a nice surprise that will be with every bite! 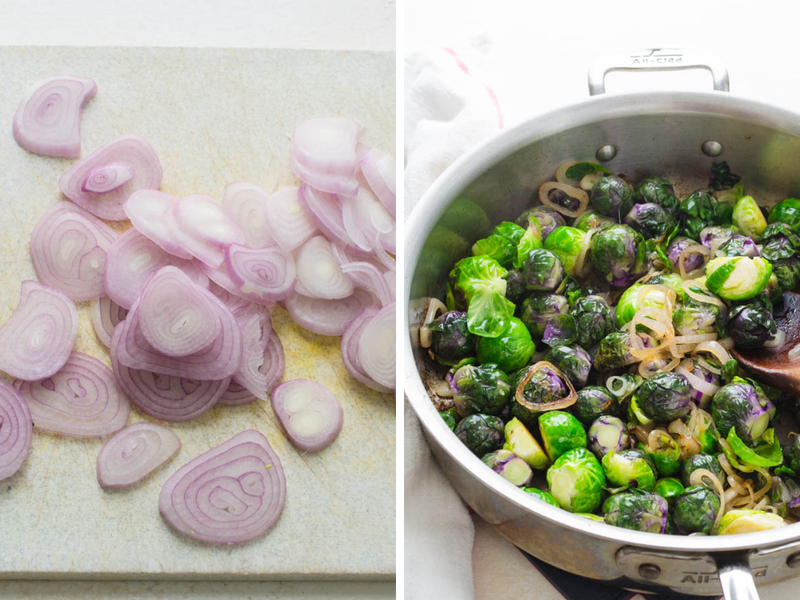 Love the colors and flavors of this brussels sprout recipe! Looks so tasty and hearty! I made Brussel sprouts last night and let me tell you they did not look as wonderful as yours do here. I can’t wait to give this recipe a try. I love brussel sprouts, so I am always looking for new ways to cook them. This looks delicious.